Pep Guardiola says he cannot be afraid to upset Manchester City's players with his selection choices as they chase multiple trophies. City's all-time leading scorer Sergio Aguero appeared dissatisfied on Saturday when Guardiola took him off before the hour-mark for Gabriel Jesus in the 4-1 victory over Tottenham. The Premier League leaders had a narrow 1-0 lead at the time but scored three times in the final 20 minutes at the Etihad Stadium en route to their 16th successive triumph in the division. 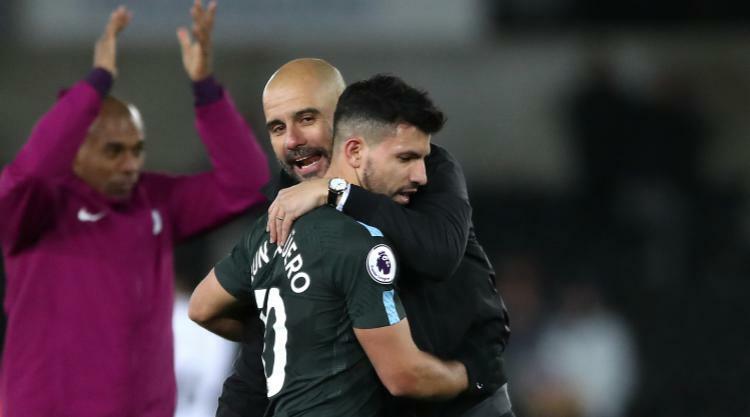 While Guardiola was sympathetic towards Aguero's frustration, he views such bold calls as necessary if City are to maintain a start which has seen them open up an 11-point gap at the summit before the campaign's halfway point. "That's normal," Guardiola said of his striker's reaction to being replaced. "The players want to play and I can understand him. He is a top player. But at that moment I needed a little more energy with Gabriel in that position. That is why I decided to take a decision. "Always I don't want to hurt the players, believe me. Always I understand them because I was a football player and they want to play. But I have to take decisions. "Before the game I thought the best option was Sergio and said to Gabriel I thought that. (If) he's sad and upset, I'm sorry but I'm just thinking about the next one. "When the manager takes a decision and we win, always we are right. When you don't win, you make a mistake. So, it is simple like that." Guardiola will have more selection headaches for Tuesday's Carabao Cup quarter-final clash with Leicester at the King Power Stadium, when those who have been used sparingly in recent weeks could get their opportunity to impress. Goalkeeper Claudio Bravo has been chosen between the sticks in the competition's previous two rounds - saving two spot-kicks in the penalty shoot-out victory over Wolves - while two of midfielder Yaya Toure's four starts this term have been in the Carabao Cup. "Always when I take a decision I always think about many things; it is never personal," added Guardiola of his selection policy. "I trust the guys a lot. I don't want to offend the players. For me it breaks my heart when Danilo cannot play, Bernardo (Silva) cannot play, Yaya cannot play, when other players cannot play. "It breaks my heart because they deserve (to play) but we have no other choice."